The fog lifted today. I could tell before I even opened my eyes. It was the garbage men that gave it away. The fog muffles the sound of the Tuesday-morning garbage truck and this morning I could hear it loud and clear. The men were shouting and the truck's hydraulics were howling. Right then at 5:00 AM I knew the fog was gone. A rain storm blew out the fog and stale wood smoke. It brought back some sparkle to the afternoon light. Right now, in the dark, I can hear the rain sing in the downspouts, which tells me a second storm is now in and that means the fog won't back for awhile. The stillness at the farmer's market on Sunday was a sign that something was brewing. The air hung low. Hardly anyone was there. A lot of the vendors have been gone since Christmas and we won't see them until the new crops come up. Right now just about all we have is some winter lettuce and bitter greens. The market seemed eery like everyone was waiting for the storm to come in. I looked around and knew we were in for some wet days so I went to the guy who has my favorite bitter greens. There's nothing like slow-cooked bitter greens on a cold day. Winter tempers the bitterness and the slow cooking brings out their inherent sweetness. I never feel like cooking anything slowly in summer but winter's quiet makes me want to cook all day. In a world of gray, the bright green on the table reminds me that spring is close. The winter market makes for good photography. The summer market vibrates with energy and contrast. It's a tricky thing to negotiate with a camera. 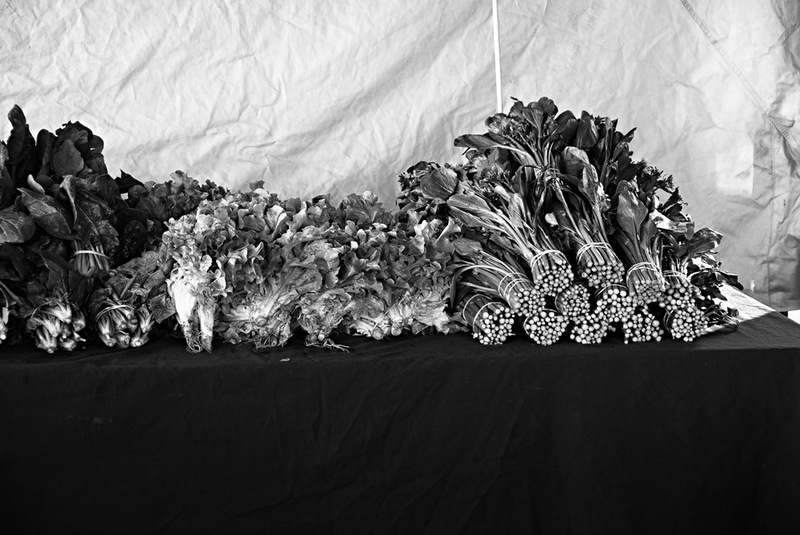 The winter market, on the other hand, is a giant still life. I can stare at the bitter greens and have them to myself. It's not like fighting with the old ladies over the tomatoes—something I hate to do. No one stands in line for bitter greens. It's just me and the greens. And a little fog and rain.